← The Art of Relaxation ~ Calm and Sense in Raleigh. NHL All-Star Wide Open Celebration in Downtown Raleigh This Weekend! I’m sure you’ve heard by now that the NHL All-Star game will take place this weekend in Raleigh. In addition to thrilling hockey fans, this event will provide great national exposure for the Triangle. To help celebrate the occasion, downtown Raleigh will be filled with festivities all weekend long at the Convention Center and along Fayetteville Street starting today. While you need a ticket for the Fan Fair held inside the Convention Center, the NHL Wide Open festivities along Fayetteville Street and free concerts at the new downtown amphitheater are open to everyone. 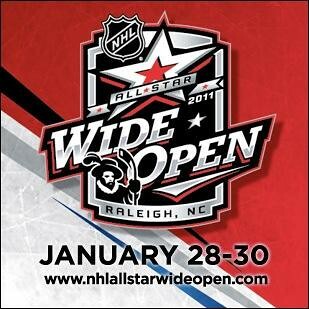 For details about all the NHL All-Star Wide Open activities planned for this weekend check out the event’s official website.